Ready to kick your workout routine into high gear? In this "Power Hour" class, you'll begin with a 15-minute warm up that will get your blood flowing and heart pumping, with a series of stretches that will prepare your body for the cardio to come. Then, you'll move on to the main show -- kickboxing! 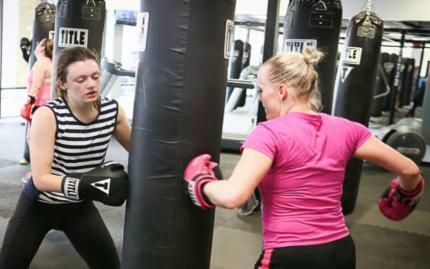 You'll follow along with a trained professional who will take you through drills that will teach you basic kickboxing moves, like front kicks, back kicks, jabs, roundhouses, and many more! Finally, you'll give your body a nice 15-minute cool down by engaging in toning and sculpting exercises that will make sure all your work sticks to your muscles. Sounds like a total K.O.! Note: This is a free trial for first time students only. Gloves will be provided.